Tomato Juice | THERMO Spoken Here! Tomatoes and tomato juice are easily damaged by high temperature. 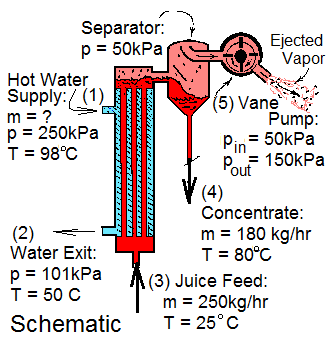 Concentration of tomato juice is accomp­lished using modest heating (by hot water in a heat exchanger) followed by mechanical extraction of water by action of a vane pump. The vane pump maintains a low pressure over the juice and ejects water as vapor from the separator. The concentration process has two flow streams. Hot water (1) enters, cools as it passes the juice (in counterflow) then exits (2). The other stream, juice, enters, (3) is warmed then enters the separator where its stream divides into concentrate exiting as liquid (4) and vapor exhausted by the vane pump (5). Use the information of the drawing. Calculate the mass rate of water that exits the vane pump as water vapor (5). Calculate the mass rate of Hot Water for this system. We approximate the juice as water. They are liquids as they interact in the heat exchanger. We use specific heats to express the enthalpy changes. Calculate the least horsepower of the vane pump. ♦ We write the energy equation for steady operation of the vane pump. The kinetic and potential energy changes of the flow of vapor through the pump are negligible. The vapor passes through the pump quickly with too little time for heat. We return to the energy equation with this information. A style of this author is to avoid algebra. The positions of the terms of an equation are part of the meaning of the term. Nothing is gained by rearranging a thermodynamic equation.